Kenyan farmer-turned-world-record-holder Dennis Kimetto crossed the Berlin Marathon finish line alone, in an astounding 2 hours 2 minutes and 57 seconds. But in this instance, as in others that press hard against the limits of endurance, it was a team effort, with a cadre of sherpas doing the heavy lifting to put one or two of the likeliest candidates in a position for a summit bid. Pacemaking is a thankless job, aside from the guaranteed paycheck, and while they're rarely credited with success, pacemakers are frequently blamed for poor results, as Haile Gebrselassie discovered at this past spring's London Marathon. The list of athletes who can reliably, metronomically bring the leaders through 30K (18.6 miles) at world record pace is short indeed—less than 60 men worldwide right now—and those on it are more interested in losing a kidney going for their own gold rather than being an anonymous bit player in someone else's show. Two crucial members of team Kimetto, pacemakers Wilfred Kirwa and Geoffrey Ronoh, threw it down in what must have been a near maximum effort, a world record in its own right, yet were only mentioned by name in one account of the race. They deserve a little ink of their own. Kenyan Wilfred Kirwa, 28, marked himself as a good man for heavy lifting when, in one of his first breaks from the gate, he turned in the second fastest time ever for 25K, 1:11:29. That's about 4:36 per mile pace. Of course, the only reason anyone cares about a fast 25K is that it portends a fast marathon, where fame and fortune reside. So Kirwa set off in the 2013 Berlin Marathon, his debut, with the leaders at a pace that resulted in a world record for Wilson Kipsang. Unfortunately, Kirwa struggled after 25K and dropped at 30K, nonetheless posting an official 1:28:02. That's within spitting of what was then the world record for 30K, 1:27:38. He went on to finish the Vienna Marathon this past April in a disappointing 2:11:42. You see what happened: Twice he proved capable of world record pace through 30K, and twice the full marathon eluded him. Baby needs shoes so... Kirwa ran the 30K of his life in Berlin, evenly clicking off 4:42 miles, but he must have dropped out just before the actual 30K mark. Even though he pulled three runners—Emmanuel Mutai, Geoffrey Kamworor and Abera Kuma—to a world record for 30K, 1:27:37, neither he nor fellow pacer Geoffrey Ronoh are listed on the IAAF record list, nor was the time included on his running resume. Though he's nearly 32 years old, Kenyan Geoffrey Ronoh has the sparest of CVs, with his first professional race appearing in January 2013—an unimpressive 2:15 marathon in India. Undoubtedly Ronoh is one of the 80 or so potential world record holders who do the same high-intensity training as big stars like Wilson Kipsang and Geoffrey Mutai in Kenya, hoping for the chance to show their stuff on an international stage. His lackluster marathon and lack of other credentials meant Ronoh's big chance came at the Olomouc Half Marathon in the Czech Republic this past June. As a pacemaker. 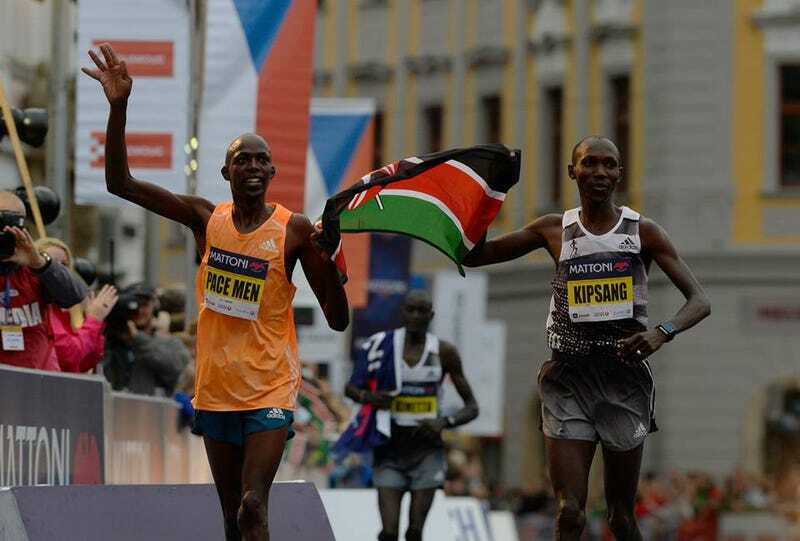 The race was supposed to be a duel between sub-2:04 marathoners Wilson Kipsang and Dennis Kimetto. Kipsang enlisted Ronoh to be his personal pacemaker, a duty Ronoh fulfilled, and then some. Per Kipsang's prerace instructions, Ronoh set a world record pace through the 10K point, after which, Kipsang figured, they could ease off having vanquished all competitors. He may have forgotten to tell Ronoh about the easing off part. Wearing a bib that read Pace Men (see above), Ronoh pulled away and won in a course record time of 1:00:17. Two months later, having earned a name on his race bib, Ronoh used similar tactics to upset 2:04 marathoner Geoffrey Mutai and win the Prague Grand Prix 10K in a blazing 27:28. To Berlin organizers, Ronoh was a perfect pacemaker—clearly capable of 4:42 miles through at least the halfway point, not yet ready for the full marathon... or was he? Pacer +1. The world record first 30K Ronoh helped happen was certainly a confidence builder for his marathon ambitions, but like Kirwa, he must have dropped just prior to 30K—his name doesn't appear in the record books. There's plenty of running left after 18.6 miles, and Dennis Kimetto could still have failed to achieve the world record if it were not for the continual pressure of fellow headliner Emmanuel Mutai, who finished 16 seconds back, also dipping under the previous world record. Though he was not altruistically combusting internal organs to help Kimetto win and set a world record, he did have that affect, and paid dearly for it. According to a report in RunnersWorld, "Mutai cramped up badly, limped a few meters, then tried to drink some water. Twenty seconds later, it came back up, and Mutai doubled over in agony for many minutes before eventually being helped away." Kimetto is a humble man though, not long from the anonymous sherpa ranks himself. In 2012, on the same stretch of road under the Brandenburg Gate, newcomer Kimetto seemed able but not willing to pass his training partner and Kenyan star Geoffrey Mutai. Mutai won the race, and the accumulated points to secure the World Marathon Majors $500,000 bonus. Kimetto was content to play a supporting role then, but added, "...in future, I will compete for the world record."